These concerts of Michael Tilson Thomas conducting the world-class San Francisco Symphony performing Leonard Bernstein's Symphony No. 2 and Gustav Mahler's Symphony No. 4 are going to be special musical treats for classic music lovers. Starting tonight at 8 pm, through Saturday's evening concert and the final one on Sunday at 2 pm, you'll have the chance to experience our symphony players at the height of their beautiful powers to delight the ears and stir the emotions. 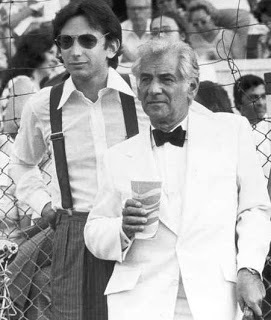 Mike and I have never heard any of Bernstein's classical symphonic works performed live and he created much incredible music for classical orchestras, that simply and unfortunately isn't played as often as his works for Broadway. We're hoping to catch one of the concerts this weekend and spending time in Davies Symphony Hall with hundreds of other Bernstein and Mahler fans, not to mention fans of MTT! For more info on the concerts and ticket info, click here.